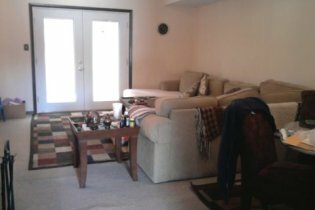 I need help choosing and coordinating house painting colors with my existing decor. 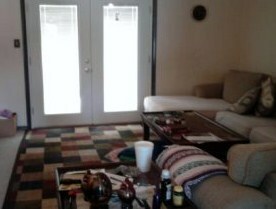 The carpet and sectional are tan. The rug is multi colored. The dining room set is fabric burgundy. There's a new french door we put in two days ago, and dark wood trim and doors thoughout the house. Thank you for your help. The pictures were taken on a cell phone and may not be very big. Thank you in advance for your ideas! whenever there's 3 or more colors present in the decor, it's better to re-use one of them on the walls. Otherwise things can start looking too busy and out of control. So that's what we are going to do with your Living and Dining room area - we'll use one of the multiple colors you already have in the space. Since we have several colors to choose from, we need to use the process of elimination in order to zoom in on just one color. We can't use the tan/beige color of the sectional on the walls, because then your furniture will blend in too much, so this one is out. 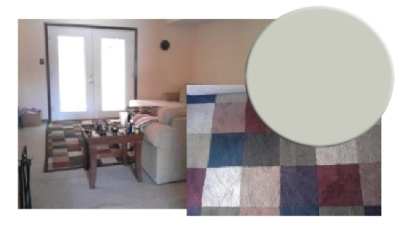 The white found in the carpet would be wrong on the walls as well - because there's too many muddy shades in your decor that wouldn't work with white. Plus, your living/dining room area doesn't get enough natural light, and white need a LOT of it to look good. The violet is usually not the best choice for living/dining room areas, especially in an open floor house (difficult to transition). The same goes for this particular shade of blue, which can also date the whole look considerably. So, what are we left with? It's green of course! It will coordinate nicely with all your furniture and accent colors. So there you have it - an easy and effective method for choosing and coordinating paint colors with existing decor. Enjoying these paint color critiques..
Yelena your advice really makes me think differently about the colors in my home and I love reading your lessons. Keep on with the good work. Join in and write your own page! It's easy to do. How? Simply click here to return to Paint Colors Critique. Copyright © 2007-2019 HousePaintingTutorials.com. All rights reserved.